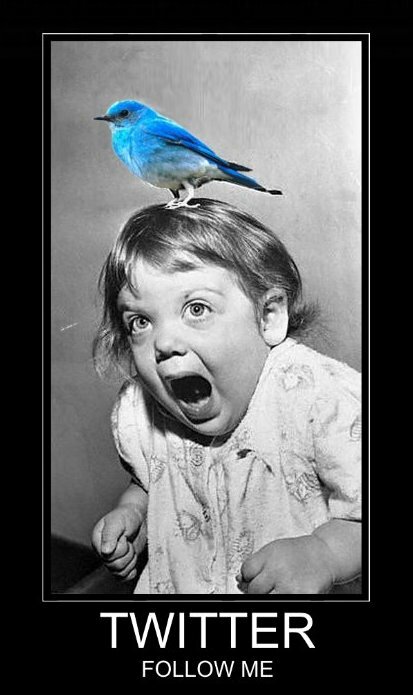 I have to admit, when I first heard of Twitter I thought it was just a place for people to gossip. When I first logged in, I felt like I got a dose of TMI facebook status messages on steroids. There was too much information that I DIDN’T want to read and hard to sift through all the mess to find things I DID want to read. Then I switched my Twitter account to “private” hoping that meant it would be easier to filter out what I didn’t want to read. Eventually, I stopped using Twitter, and stuck with my Facebook account where I could block nonsense and friend people who really mattered to me. What I didn’t understand was that Twitter and Facebook are two very different entities. I love Facebook. It has brought me closer to friends and family members that I never had much of a chance to get to know growing up. Being deaf, I always felt as if I was missing out on much of the world–my whole life was a big “nevermind” when people couldn’t find the patience to communicate with me. Facebook has allowed me to share my world with those closest to me and for me to catch a glimpse of worlds I missed out on. I have been begging a fellow tech-savvy colleague of mine to join me on Twitter. She doesn’t “get” the hullabaloo. What’s the big deal about Twitter? In looking for a good way to explain it to her, I developed this analogy: Facebook is like attending a reunion, Twitter is like attending a conference. Facebook is you, inside, letting as much or as little of the world into your neck of the woods. Twitter is you getting out of the house and joining the party. You don’t go to a party just to shut yourself in a room with a few select people trading Pinterest recipes and talking about the crappy instagram pictures you all took of your kids. Hence, making a private Twitter account is worthless. If you want privacy or intimacy, stick with Facebook. Now that I’ve been on Twitter a bit more, I understand that I can choose which parties to attend (hashtags), zoom in on people who are making waves (@mentions) and strike up conversations “near” those people in a way that grabs their attention (RTs or multi-@mentions). You just have to find the right people to follow and the right hashtags to use. I’m developing a digital footprint that puts me on the map. I’m starting to make a contribution to my profession. Most importantly, I’m developing a network of professionals that continually feed my growth as an educator. This past fall I was ready to turn in my letter of resignation and don the blue Walmart apron. I was sinking fast and becoming burnt out. I also felt very frustrated and alone. Through Twitter, I have found myself and a new love for teaching. On Twitter I found @ajoycetb and @naomishema who have invited me and my students to become global friends. I found @guster4lovers and @thomasson_engl who make the world of teaching English through #coflip model seem highly attainable. I found @johntspencer and his blog always willing to openly and candidly discuss the more difficult aspects of the teaching profession. I found @techsavvyed who has simplified my use of technology by demonstrating true integration. Cheryl, Andrew, Ben, and John have also ignited my inner writer (hence this blog) by being so open in their reflection of their teaching practices; they have reminded me why personal and professional reflection is important. There are so many wonderful teachers sharing on Twitter. There are also plenty of administrators giving us their side of the coin. I’m coming out of my shell and I no longer feel alone. I recommend to all Twitter newbies that you start off by attending a “chat”. Some of my favorite chats are #engchat, #rechat, #flipclass and #txed. You can go to a site like tweetchat.com, type in your hash tag and simply follow along with the conversation. If you feel up to it, join in. Hash tag chats are a great way to find people to follow. If you want more people to follow you, then you’ve got to offer them something. Share links, swap quotes, retweet content. I think teachers who are not yet connected are really missing out. I’ve gotten a lot of great ideas from my Twitter PLN (professional learning network). People post so much valuable information and share plenty of innovative ideas. Finding my way around Twitter has lead to the best professional development I have ever experienced. It has allowed me to embrace the failures and share my experiences with the world. So, give Twitter a chance; you might just find that coming to the party is a lot more fun than swapping Pinterest recipes!